The Cage is a 5,000 square-foot softball and baseball facility, with 5 cages and state-of-the-art training equipment. Haley Woods is a Bay Area softball legend. 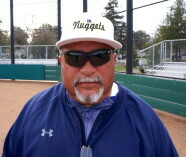 She has played and coached softball in the Bay Area for more than 20 years. Haley was Cal’s starting catcher in each of her four years at Cal, and the only Cal player to start every game in 2004, 2005 and 2006. Cal’s official softball guide correctly describes Haley as “one of Cal’s all-time greatest hitters, holding the Cal record for RBI’s and total bases in a career.” Haley led the Cal Bears to victories at every level, including three appearances in the Women’s College World Series. Playing at the highest collegiate level, Haley earned a career batting average of .314 and a career slugging % of .584, including 38 doubles, 48 home runs, 413 total bases and she holds the Cal Bears Career Record for RBIs with 191. Haley was named NCAA NFCA and Easton First Team All-American, Diamond Sports Catcher of the Year, All-Region First Team and Pac-10 First Team. Contact Haley Woods for availability. Contact Frank Fano for availability.